Portable vacuum cleaner is one of the best cleaning appliances for household work, especially for the people who are living in a tight space. Most of the handheld vacuum cleaners are powered by battery and designed in a compact size. Therefore, this is easy to find a place to storage the device and work with you. Do you have any experience about hand held vacuum cleaner? Then, you can get full idea about the cleaning appliance. The device will always provide you good cleaning experience with strong suction power. 1 What is a portable vacuum cleaner? What is a portable vacuum cleaner? A portable vacuum cleaner is a compact size designed vacuum that mostly powered by battery to cleaning easily. This type of vacuum is lightweight, easy to use, compact in size and cordless. Moreover, this does not need much space for storage. This vacuum cleaner is available in separate as well as built-in with upright vacuum cleaners. Therefore, you have two options to purchase the vacuum cleaner. 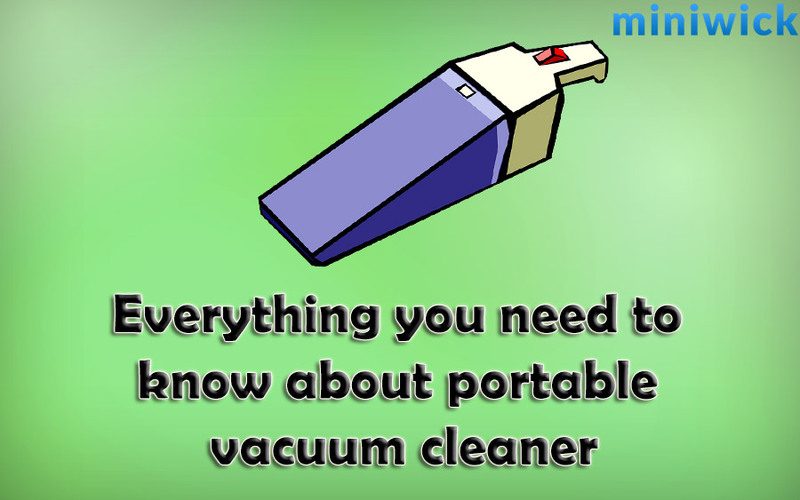 Do you know the basic features of the hand held vacuum cleaner? The features can give you the best idea about the cleaning appliance. Just look at the features and you can easily get the idea. These are the common features of the vacuum cleaner. So, let’s know more detail about the classification! There are many benefits of using a portable vacuum cleaner than others. Do you know the advantages? The vacuums will always give you a good way to clean your home and make it dust free. There are so many benefits, but we are highlighting the top benefits for you! The vacuums are very compact in size and design. As a result, this is easy to carry and storage in your home. Moreover, you can clean the tight space and corners efficiently using the vacuum. The vacuum cleaner is very easy to control and use. Normally, they do not provide many features to understand. So, you can read the manual instruction one time before you start using the device. Most of the vacuums of this classification are cordless. They are powered by powerful turbo batteries. You will get 15-30 minutes backup from the battery. However, this is important to choose the vacuum wisely because the quality of the battery is really a fact for it. As the vacuum cleaner is not too much big, this is good for tight space living people. It does not require much space for storage. Moreover, the maintenance cost is also low. Hand held vacuum cleaner is the best device for cleaning automobile properly. When you are using upright or best canister vacuum cleaner, you will need to carry heavy weight vacuum. Moreover, this is important to use additional accessories for cleaning pet hair and automobile. But, portable vacuum cleaner can easily reach to the tightest corners of the automobile. As a result, there is no need to use any additional accessories to clean automobile. The vacuums are very lightweight and flexible to use. The handles are ergonomic friendly to avoid any pain after use. Moreover, you can easily lift the vacuum and clean any part of your home. The portable vacuum cleaner is very economical and low maintenance cost. As this is a small cleaning device, this will not consume much power. So, this will not have big impact on your utility bills. There are disadvantages of the vacuum cleaner too! This is important to know the adverse sides as you will invest money for keeping your home clean. They are not major concerning points but you will to know before you make a final decision. Although they are good for cleaning, the suction power is low than upright or canister vacuums. Therefore, the vacuums are not suitable for heavy duty work like cleaning full home at a time. You will need to be more careful of choosing the best portable vacuum for home. There are many models available in the market. If you choose a model with low suction power or low backup time, you will suffer. How much time do you want as backup for your vacuum? Generally, you will get 15-30 minutes of backup time. More backup time means more expensive vacuum. However, 30 minutes may not enough for cleaning full home in a day! Some of the models are quick to recharge and some are very slow. According to the users, many models need more time to recharge the battery after using 6 months or more. As a result, this could be a big problem for you! Portable vacuums are very popular for its quality, design, and compact size and lightweight. This is important to choose the vacuum wisely especially notice the battery backup power, recharge time and suction power. Don’t forget to consider the price, warranty and additional accessories with the handheld vacuum. Do you have more questions about the vacuums? Then, feel free to ask and we will surely response to your question very quickly. You will also get good cleaning experience from the vacuum. Best of luck!